Built by Skinner & Eddy Corp, Seattle WA. 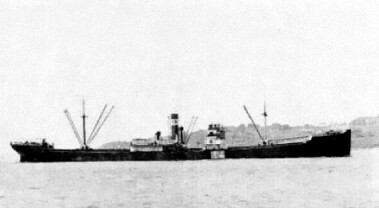 Owned by: Lykes Bros SS Co Inc.
SS Cripple Creek sailed from New York on June 29, 1942 bound for the Persian Gulf and India via Trinidad with a cargo of 7,600 tons of war supplies (aeroplanes, tanks and ammunition) for the Russian Government. On August 13, 1942, Cripple Creek, was sailing unescorted about 400 miles west of Freetown, Sierra Leone when she was was struck on the starboard side opposite #3 hatch by a single torpedo from U-752. The master (Matello Norby Olsen), nine officers, twenty-nine crew members and thirteen armed guards abandoned ship as a second torpedo struck the port side opposite #4 hatch which rapidly sank the vessel. The crew, in three lifeboats, were rescued by the British armed trawler HMS Saint Wistan (T 105) on August 16th and 17th and landed in Freetown. U-752 recorded the position of the sinking as grid reference ET 7317 (4.55N, 18.30W) and by Captain Olsen as 4.42N, 18.28W. One crew member, William V. Cowden, an Oiler aged 32, lost his life. The survivors were later repatriated on navy transport and arrived in New York on September 2, 1942. Additional information kindly provided by Mrs. Helene Stein.